What sets your organization apart from the rest? 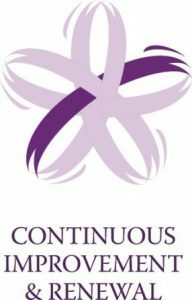 The process of continuous improvement and renewal starts with an HPO adopting a unique strategy that will set the company apart by developing many new alternatives to compensate for dying strategies. 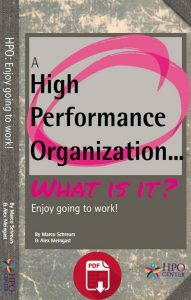 After that, an HPO will do everything in its power to fulfill this unique strategy. It continuously simplifies, improves and aligns all its processes to improve its ability to respond to events efficiently and effectively and to eliminate unnecessary procedures, work, and information overload. The organization also measures and reports everything that matters, so it measures progress, monitors goal fulfillment and confronts the brutal facts. It reports these facts not only to management but to everyone in the organization, allowing all organizational members to access financial and non-financial information needed to drive improvement. People at an HPO feel a moral obligation to continuously strive for the best results. The organization continuously innovates products, processes and services, constantly creating new sources of competitive advantage by rapidly developing new products and services to respond to market changes. It also masters its core competencies and is an innovator in these core competencies by deciding on and sticking to what the company does best, keeping core competencies inside the firm and outsourcing non-core competencies. Our organization has adopted a strategy that sets it clearly apart from other organizations. In our organization processes are continuously improved. In our organization processes are continuously simplified. In our organization processes are continuously aligned. In our organization everything that matters to the organization’s performance is explicitly reported. In our organization both financial and non-financial information is reported to organizational members. Our organization continuously innovates its core competencies. Our organization continuously innovates its products, processes and services. competitors. Bank products are bulk commodities, they look more or less the same in all banks. If one bank creates a new product it is not difficult for the competitors to copy that product quite fast. The difference is in strategy execution. We say that 10 percent is about content and 90 percent is about execution of the strategy. That is why we are structured differently and why we behave so differently from the average competitor. We also say ‘walk the talk’. We want our managers to be a good example for everybody, a visible example, and not just sit in their offices making strategies that everybody else should follow. No, they should be the first ones to show employees how the strategy should be executed. And that in itself is also different from other banks.